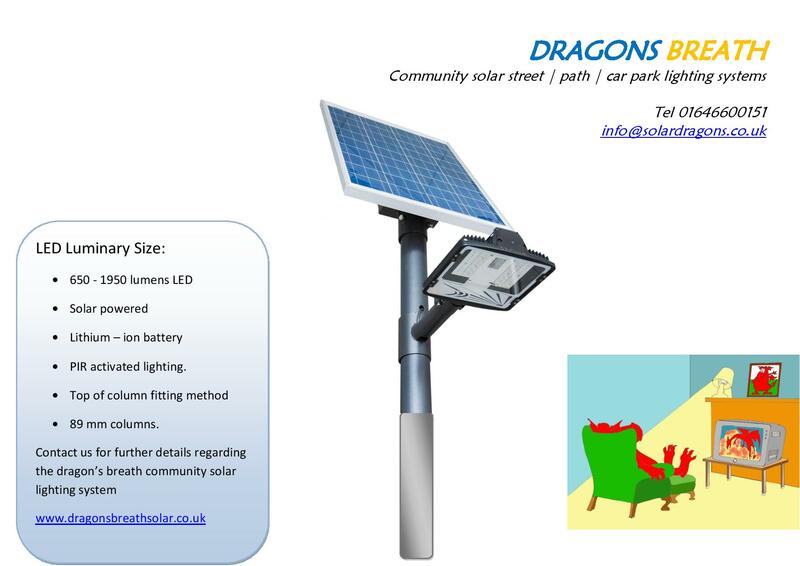 Solar Community Street light.This style of lighting system can be used to illuminate village walkways These are manufactured for use in the UK. The LED bulbs used in this product are designed to last 40,000 hours, or ten years without any maintenance cost being incurred. The heights that our standard units stand are between 3m and 5 meters. These can help to provide amenity light at sunset till the sun rises at dawn. The lumen output of this LED lighting product is 1620lm with a colour temperature of + 4,500 which provide a cool white LED light source. As required the lights can be spaced as required to provide an adequate amenity light source that would normally be around 20m apart. These could take approximately 1 hour to assemble, the fitting to column should be undertaken via a cherry picker or similar to fix in place. Once fitted and connected the solar panel system will not only be fully automatic, but also reduce maintenance time dramatically compared to the existing annual tasks of sodium bulbs. A small concrete base is required prior to any parish security installation process. Ask for more free details if a self installation process is desired.